Earlier in the week I wrote an article about the true nature of the 4-3 Defense. The way I see it, anyway. The 4-3 Defense has certain rules. A few years ago I wrote about the 8 Laws of The 4-3 Defense. Block down, step down. Spill the football. 7 Man Front. Mike Linebacker has to be a 2-gap player. I know a lot of people don’t see the 4-3 Defense this way. That’s OK for them. For me, the Miami 4-3 Defense as it was designed by Jimmy Johnson and his staff at The “U” is where it’s at. And it is still one of the best defenses in football. So sit back and listen to How To Coach The 4-3 Defense! Want to learn more about the 4-3 Defense? 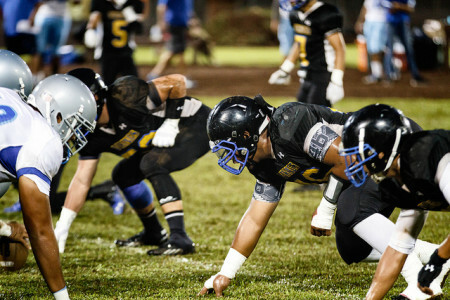 Check out my eBook, Installing Football’s 4-3 Over Defensive Front. There are only 4 types of defense. Listen to Episode 80 to learn them. [19:31] We spill everything in the 4-3 Defense. [31:40] Listener Question: What is your evolution of teaching Linebackers and Defensive Linemen? [39:30] Listener Question: How does my team of bigger kids combat teams with faster players?